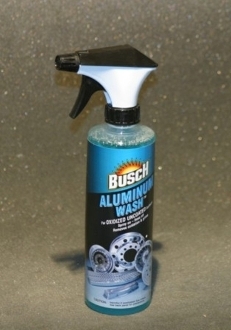 Aluminum Wash is an acid-based cleaner for uncoated aluminum surfaces. Special surfactant package wisks away dirt and brake dust effortlessly! For oxidized uncoated aluminum wheels, fuel tanks, trailers and trim. Restores luster by removing light to moderate oxidation and grime without scrubbing. Easy to use spray on-hose off application. Use before polishing to reduce time and effort. Make sure wheel or surface is at temperatures between 70-80F. Dilute with water at 50/50 ratio for milder cleaning action on highly polished surfaces or clear coated wheels. Leaves uniform surface finish-"clean luster"